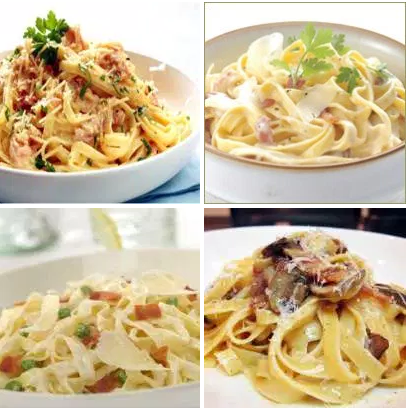 Recipes to Make Italian style Fettucini Carbonara .Fettucini Carbonara is a recipe from Italy there. 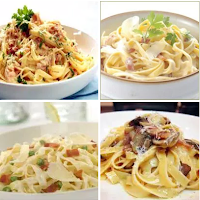 This type of pasta dishes are now much in demand by the world community, especially Indonesia. If you want to try to feel the original taste please visit the outlets of cuisine Italy is now starting popping up in major cities in Indonesia. and this cuisine includes dishes are new and popular and very loved by many people. Because it is clear this cuisine has a very distinctive and tasty. And also this dish has a way of presenting a very unique and interesting. Bring to the boil 1 000 ml of water, 1/2 teaspoon salt, and 1 tablespoon of cooking oil. Enter fetucini. Boil until cooked, then remove and drain. Heat margarine. Saute the garlic until fragrant. Add sausage, Stir well. Enter the milk, salt, and coarse black pepper. Cook until boiling. Add fetucini and grated cheddar cheese. Stir well. Turn off the heat. Enter the yolk. Stir well. Turn on the fire. Cook until bubbling. Fetucini Ala carbonara ready to serve..
0 Komentar Untuk "Recipes to Make Italian style Fettucini Carbonara"